ANAHEIM, CA—As protests over a pair of fatal weekend shootings by Anaheim Police entered their fifth day, law enforcement officials continued Thursday to ignore calls for a stricter departmental gun-use policy, claiming such rules would prevent officers from executing their essential task of shooting people. "Our job is to shoot bullets at dangerous individuals posing a threat to life and property, and we're certainly not going to respond to a request that we stop doing our job," said Anaheim police chief John Welter, who pointed out that all officers are required to carry guns, and that guns are for shooting people. "A policeman who fails to discharge his service revolver on a regular basis is failing to serve his community, pure and simple." 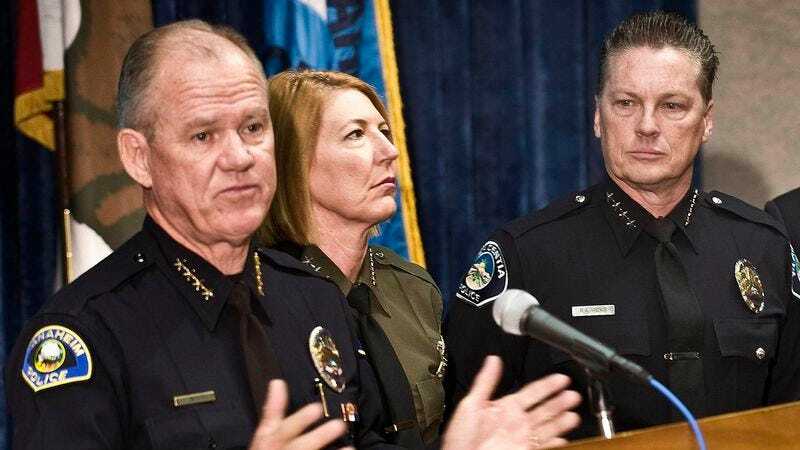 Welter added that anyone who knows anything about the history of law enforcement in Southern California should be well aware of that fact by now.